: Gain . Ancient Tomb deals 2 damage to you. ShutUpMokuba: Thanks, glad you like it! It can definitely be built on a budget. Cut out expensive mana rocks like Mana Vault and Chrome Mox and replace them with cheaper rocks. 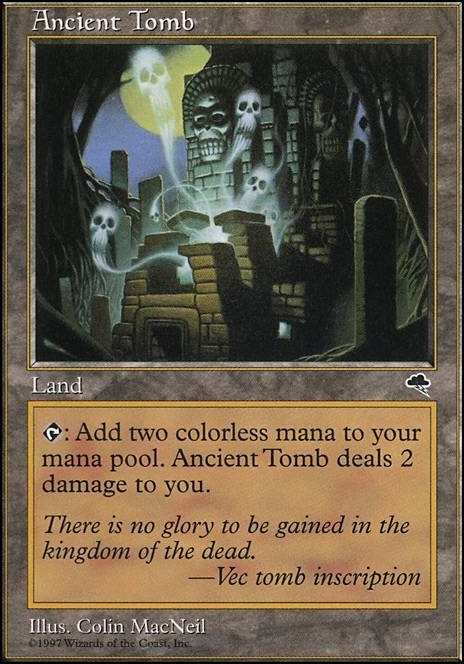 You can also cut expensive lands like Minamo, School at Water's Edge and Ancient Tomb , replace them with basic lands or dual lands that enter tapped. I like Monastery Mentor a lot but he can easily be replaced with a Silverblade Paladin , which isn't as flavorful but is a lot more budget friendly. Anything that's out of your budget range just replace with something that has a similar effect and the deck will still run smoothly, perhaps a bit slower, but smooth none the less. HorseFist on Is my Ancient Tomb doomed?? Real Quick: I won an Ancient Tomb in an EBay auction almost a month ago after 4 or so attempts, and it was sent in the mail from Oregon to Vermont on March 26th. This past Wednesday (April 10th) tracking reports that it has only made it about halfway on its journey to me.... with “visible damage” being the concise, 2-word update of its current condition (could be worse- might have said “on fire”?). Not much anybody can do about it now, except the P.O., but maybe if some people can appeal/make offerings to their favorite Gods of Death/The Underworld, it might just arrive to me in 1 piece after all. Thanks in advance! Anyone else have any stories of cards damaged or lost in the mail? Also, I am calling that Explosion Zone may break standard. Mono-Blue Tempo, Mono-Red Burn, Mono-White Aggro/Azorius Aggro, and even a few other decks could easily be pushed out if it only destroyed 1 cmc nonlands, but because decks like Sultai base themselves on Wildgrowth Walker , Merfolk Branchwalker , and Hydroid Krasis (technically always 2 cmc on field), x=2 can shut them out too. That land may also hurt control decks using Search for Azcanta Flip as their main engine, and new decks using walkers that use the 4 drop slot religiously with Tamiyo, Jace, Chandra, or 3 drop slot with the newer walkers from RNA and WAR. Not to mention a Bant Teferi, Hero of Dominaria / Wilderness Reclamation + Nexus of Fate deck that can now play Explosion Zon], tap it to put counters, untap it on endstep and hold an activation for any CMC the turn they play it over their opponent's head. 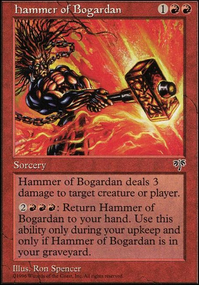 But is also is a Ratchet Bomb on a land, making it incredibly good for Red and Black EDH decks that need to destroy enchantments (or artifacts for Black EDH decks), or green decks that want creature removal. 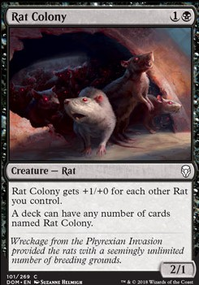 It will probably be the best utility land in colorless, IMO surpassing lands like Winding Canyons , Maze of Ith , Reliquary Tower , even Strip Mine / Wasteland etc. only being beaten by Bazaar of Baghdad for decks like The Gitrog Monster , Ancient Tomb or maybe Gemstone Caverns for fast combo decks in cEDH, and The Tabernacle at Pendrell Vale in stax lists. Just sayin' it looks to be a 50 dollar staple in 5 years. You won't regret it. She actually does a lot for your deck. I mean blinking Deepglow Skate puts proliferate to shame. For the planeswalker its ETB followed by a blink should be able to max out everyone of them on the board. That's pretty insane. She is also ramp. She can untap lands or artifacts for more mana. Double use of Gilded Lotus or Ancient Tomb or Sol Ring is a nice boost! Hmmm... Ancient Tomb , Garruk, Caller of Beasts , Garruk, Primal Hunter , ... any of those? Mirage Mirror , one of my favorite pet cards! I would probably also end up picking Bog Initiate if I were running Ashnod's Altar , too. I ran the pair for a bit, but I'm going a bit of a token fuel route with Pawn of Ulamog / Sifter of Skulls with Dross Harvester and Pitiless Plunderer . Initiate also helps with Ancient Tomb / Sol Ring / Temple of the False God , of course. 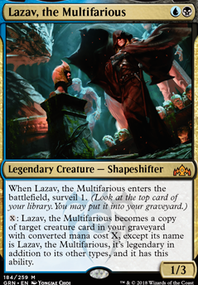 "My opponent’s don’t tend to have a shortage of blockers..." In light of that, some alternatives to Hypnotic Specter : Liliana's Specter or Plaguecrafter , and work with Sangromancer all the better. Also Vesuva could replace a Swamp, not just one of your nonbasics, because if nothing else it can be a Swamp. But of your nonbasics, Path of Ancestry only supports 4 of your cards, including Chainer, for only a rare scry 1. Has Ash Barrens been useful? 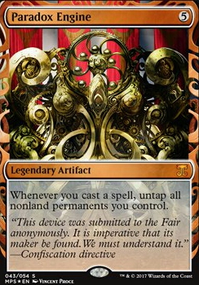 I run fetchlands because of Rings of Brighthearth and it would turn that into ", discard Ash Barrens: Search my library for 2 Swamps and put them in my hand, shuffle library". With three sources of "no maximum hand size", do you ever aim Sadistic Hypnotist at yourself as a discard outlet, or do you just not encounter a need to pitch something from your hand? putting this here so you can find it a bit easier--my recommendations are as follows. take out: Spawnsire of Ulamog , Hydroid Krasis , Ulvenwald Hydra , Cloudpost , Glimmerpost , and the three uzra lands. put in: Blue Sun's Zenith , Chord of Calling , Ancient Tomb , Inventors' Fair , Buried Ruin , Mana Crypt , Mana Vault , and Cultivate . jordanalessi My arguement implies there are many options for replacement of Phyrexian Arena . If you needed 22 three and two mana draw spells in your black list, feel free to run Phyrexian Arena , however, do you mind pointing me towards the 20 pieces of fast mana that are better than Sol Ring ? Mana Crypt , Mana Vault , Ancient Tomb , Gemstone Caverns , Chrome Mox , Lotus Petal , Mox Diamond , but I just need 13 more to not run Sol Ring , mind finding me them? BTW my commander is colorless, otherwise I'd run the rituals or spirit guides.